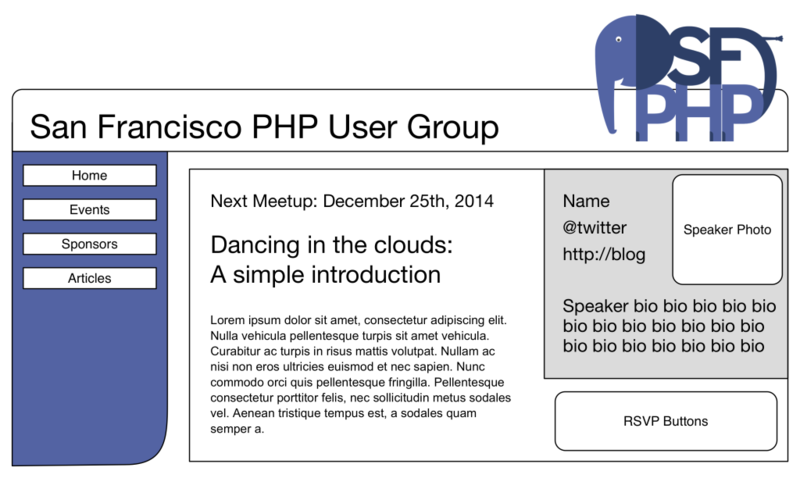 So it’s time we made a real push to connecting more with the members of the San Francisco PHP User Group. To that end, step one for any web-savvy group is always a website! I want to get a website built for SF PHP to allow us to better support and engage the PHP community: both the developers and engineers (however you wish to label yourselves) working in it, and the companies relying on it. I want to connect those two groups in meaningful ways to help promote the adoption, growth, and sustainability of PHP in the Bay Area, and beyond. The purpose of the project I am looking at, at the moment, is to get the ground work in place. We need a basic site with a simple CMS system at first, but I want to add a lot of functionality to it eventually — incorporating logging in via the Meetup.com API, talk archive, videos on the site, articles by local developers, technology articles by local php companies, eventually hooking into a custom sf php mobile app for the meetups themselves – so I think starting from a custom stack is the way to go. Secondarily, I would like the core group that builds the initial prototype do a dual-purpose meetup (perhaps in series, however it works out) which will both cover “introduction to Zend Framework 2” and “Here’s how you hack on our site to add new features.” There’s a bit more I’m trying to work out with this, but I don’t want to say anything publicly until I know for sure. I’m not super married to anything design wise, just trying to get some of the structure in place. – Recent articles if there’s a given amount of time between the last meetup and the next one. Perhaps at that point we would put the last meetup’s video where the speaker bio is and have the recent articles in the zone on the left. Basing it off of bootstrap or foundation would let us iterate faster in the group, I suspect, but I don’t necessarily have a preference.